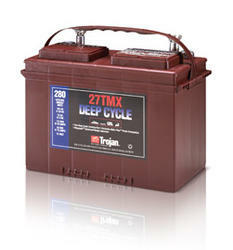 Trojan 27 TMX Deep Cycle Battery, Free Delivery to many locations in the Northeast. The Trojan 27 TMX batteries are sold with core exchanged at the time of the delivery. Length 12 3/4" Width 6 3/4" Height 9 3/4"